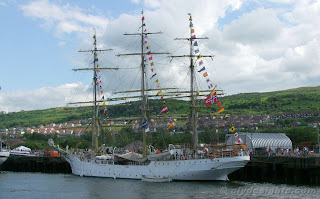 Between Saturday 9th and Tuesday 12th July, participants in the Tall Ships Races 2011 visited Greenock. The various vessels had started out from Waterford in Ireland, and on arrival were berthed either in the James Watt Dock or, in the case of the larger ships, the Great Harbour. 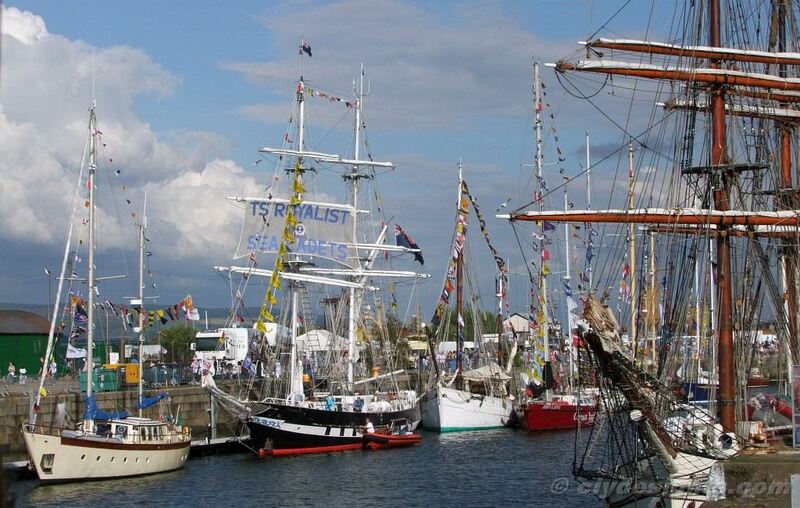 The view above shows many of the smaller vessels including the British Sea Cadets ship ROYALIST. 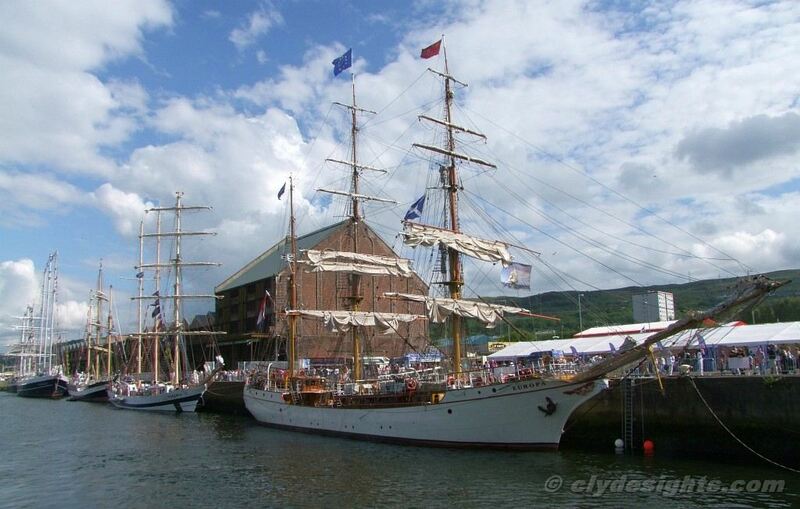 Seen alongside the south wall of the James Watt Dock is the 100-year old EUROPA, a former German lightship fully restored in 1994 as a three-masted barque in the Netherlands. The 56 metre long vessel has a full-time crew of 14 and carries 48 voyage crew. 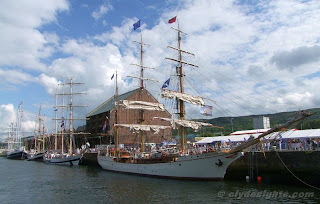 Berthed astern are the Polish barquentine POGORIA (1980), the British barquentine PELICAN OF LONDON (1948) and the Dutch schooner EENDRACHT (1989) with LORD NELSON (1985) at the far end of the dock. The five largest visitors were berthed in the Great Harbour. At the east end of the dock was the Russian fully-rigged ship MIR, built at Gdansk in 1987 as the third out of five similar vessels. 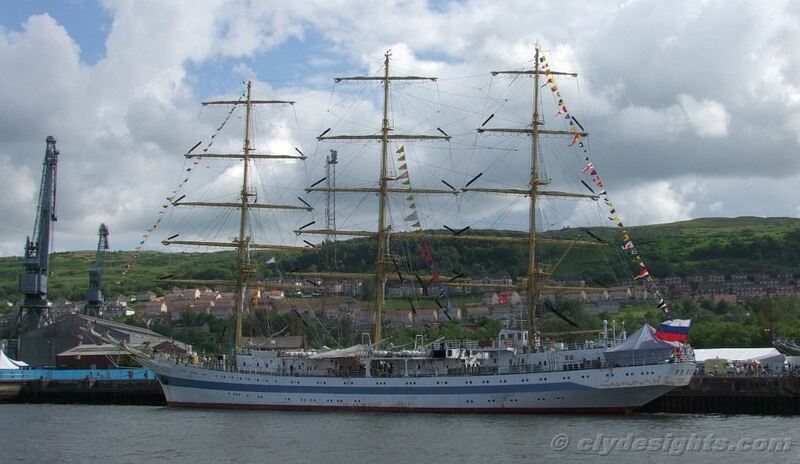 She is 109 metres long and is manned by up to 200 crew. Immediately astern of MIR was the smaller CHRISTIAN RADICH, a Norwegian veteran dating from 1937, while astern of her was the Polish ship DAR MLODZIEZY, built in 1982 and the first of the five Polish-built sisters. 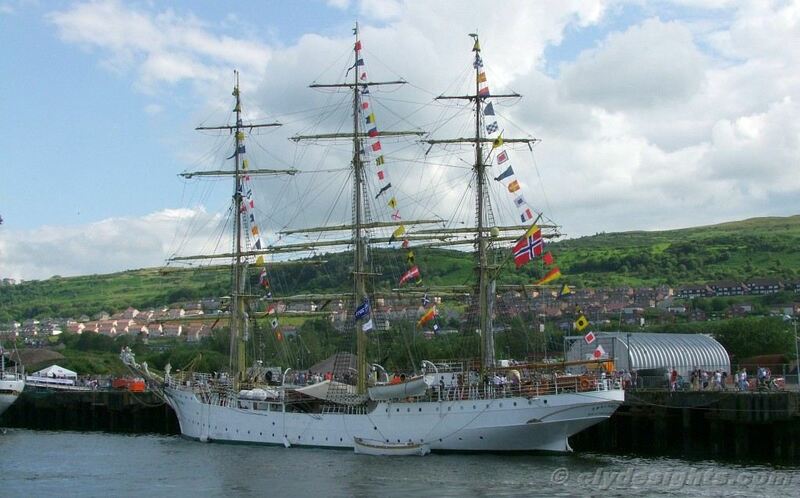 Behind her, flying a massive ensign, was the Colombian barque GLORIA, which dates from 1968. The fifth ship lying in the Great Harbour was the oldest one too, the Norwegian fully-rigged ship SØRLANDET, ten years older than CHRISTIAN RADICH and dating from 1927. The assembled ships left Greenock on Tuesday 12th July, and cruised in company to Lerwick with nine days being allowed to complete the 484 mile voyage. Stopovers were made en route, which allowed the ships to call at various ports and harbours such as Oban and Stornoway.